We travel northwest of Hague Centre today and visit the Gemeentemuseum, the famous modern art building built in the 1930s by the celebrated architect HP Berlage. The Gemeentemuseum (literally the museum of The Hague Municipality) itself has been called a modern palace of the arts. Here you'll find Art Nouveau of the Netherlands, Mondrian and de Stijl, and a continually changing display of modern art, including Delftware. See also this link to the permanent collection. In discussing some of the paintings held in this unique collection of Dutch 'Golden Age' art, let's keep for a moment to our 'posh ladies getting tipsy' theme. 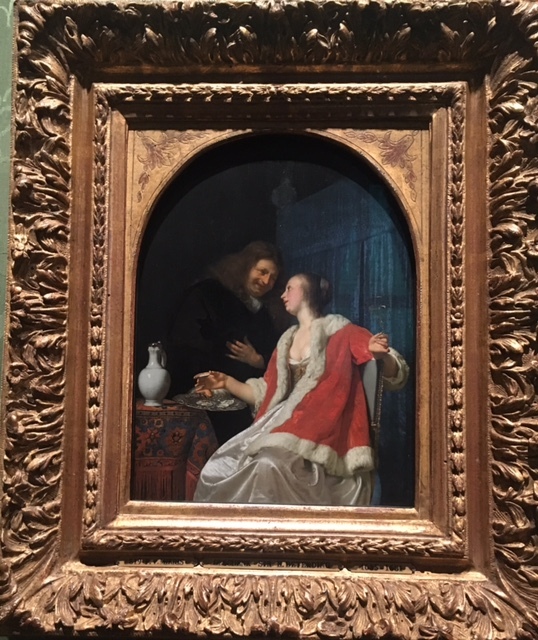 Once again, as with the Jan Steen work shown below, the artist whose work is shown here, Frans van Mieris the Elder, has played with our sense of decorum. It's a seduction scene. Aha, but the subjects are none other than Mr and Mrs Van Mieris themselves. Netherlands' artists of the Dutch Golden Age are rightly celebrated for their genre paintings - scenes from everyday life. 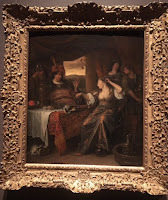 Jan Steen (1626-1679), the artist discussed here, painted scenes not only of domestic order but also of disorder. He frequently depicts drunkenness and is sometimes moralising (The Effects of Intemperance) but not always (Man blowing Smoke at a Drunken Woman). 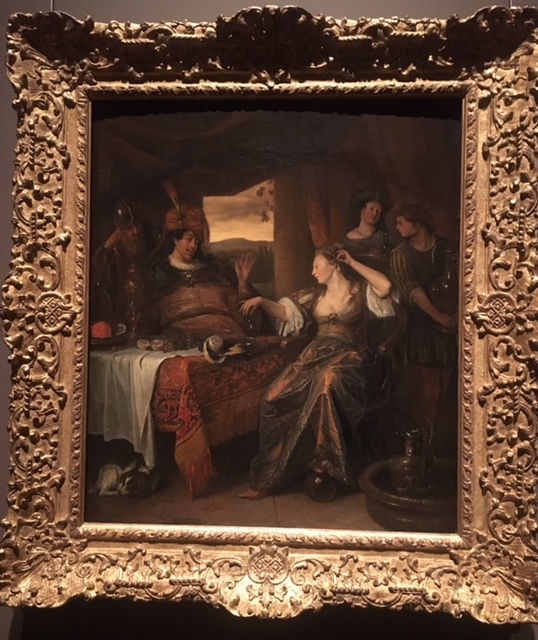 This exhibition in the Mauritshuis temporary exhibition galleries shows the artist's mastery of biblical, mythological and historical subjects. He seems to take particular delight in portraying posh ladies either with their maids getting dolled up or with some gallant getting tipsy. The example I've chosen here, a history painting (the subject of this exhibition and a genre on its own), is a case in point. Here the painter is taking on the Ptolemaic Kingdom's famous Queen, Cleopatra. Look at the way the artist shows us her loosening limbs, the relaxation of her queenly pose. She's dining with Mark Antony by the way, whom she eventually married; here she's shown literally letting her hair down. 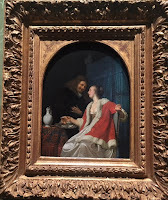 In a forthcoming post we'll get on to some of the paintings in the Mauritshuis permanent collection. You might know some of the works already? Johannes Vermeer's Girl with a Pearl Earring and View of Delft; The Goldfinch by Carel Fabritius . . ..